Griffin said soon after she got the notification for a tornado warning last night she heard strong winds that sounded "just like a train" coming down her street. 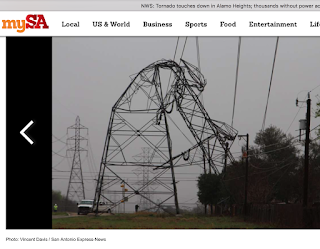 According to San Antonio Fire Department spokesman Woody Woodward, only five San Antonio residents had minor injuries in the storms, even though more than 100 homes were damaged. "Which is amazing," Woodward said. Again, while preliminary, it is not so much amazing as it is the warning system. Congratulations to the NWS and everyone involved!